There are all kinds of experiments going on in digital media, from crowdfunding projects like Beacon Reader to mobile-first apps like Circa, but one of the most consistently experimental sites around is Quartz, the business-news site that Atlantic Media launched last year. 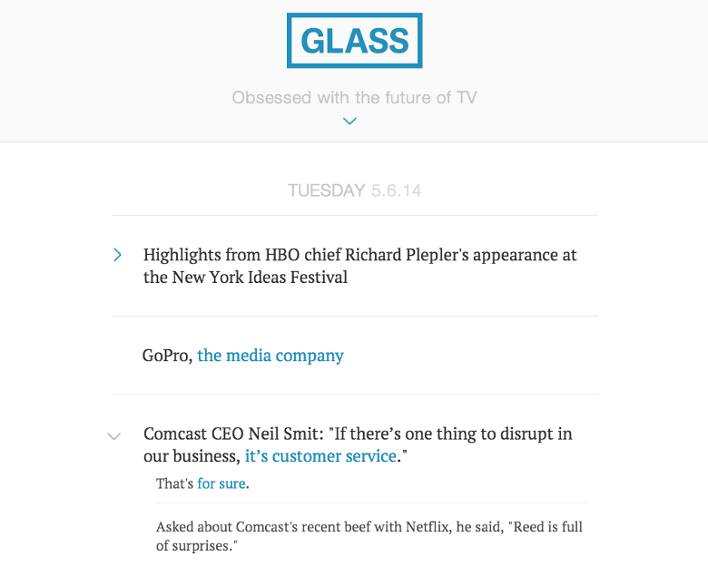 Quartz has introduced a number of interesting features since it appeared on the scene — including its “infinite scroll” design and a form of reader comments that it calls “annotations” — and now it has launched another one with a new vertical called Glass. In terms of content, site editor Zach Seward says in his introductory post that Glass will be fairly traditional, in the sense that it will both aggregate existing content from other sites about the evolution of the TV market, as well as hosting original content about the topic. What’s different is the layout and design of the site, which is powered by blog pioneer Dave Winer’s Fargo software. Fargo is what software designers call an “outliner” — a category of program that allows a writer (or anyone, for that matter) to easily capture information and then structure it as a series of bullet points, each of which can be either expanded or collapsed individually. I talked with Dave last year about a related product called Little Outliner, and how it could be useful for journalists. A number of people have used Fargo in different ways — such as journalism student Blake Hunsicker, who has been experimenting with using it to format content, including a presentation by his professor Jay Rosen — but to my knowledge Quartz is the first large-scale news site to use it as the foundation for a new vertical. It seems like a small thing, but the implications are potentially large. What’s most interesting to me (and I expect to Quartz as well) is how well the Fargo interface works for consuming the news on a mobile device: each segment of a story, as identified by an angle bracket, can be expanded individually if the reader wants more information, or collapsed if they just want to browse and get the sense of a story. In some ways, it’s similar to the approach that Circa takes, where a distinct fact or piece of information is the “atomic unit” of news, not the story itself. Will the Fargo format catch on? I don’t really know. But I think it’s an interesting experiment in trying to give readers a different way of navigating the news (I could see Vox using something similar for its point-form context cards) and Quartz deserves some kudos for trying it out. Sounds a bit Ted Nelson-Esque… how does this differ from Project Xanadu?